Perfect for my kitchen for a little extra space. Easy to put together and is very well made! For more counter and storage space, the Avenue Greene Somerville Kitchen Island is the perfect solution. Whether you want to chop vegetables or keep all of your kitchen accessories at reach, the island will come in handy. The island features a solid wood top allowing for convenient additional work space in your kitchen or dining area. It has a drawer and cupboard with attractive silver handles to help you store your kitchen essentials. The built-in towel bar and spice rack provide easy access to utensils and other accessories. 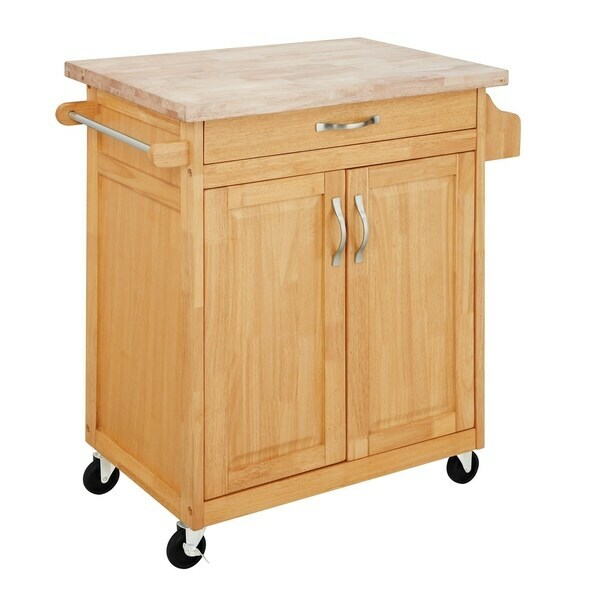 The casters on this portable island allow you to easily move the cart at any time, and can be locked into place for added safety. The stylish design of the Avenue Greene Somerville Kitchen Island provides a subtle yet spacious storage option for your kitchen. Dimensions 19.0 In. X 32.0 In. X 35.5 In. This cabinet was easier than I thought it would be to put together. 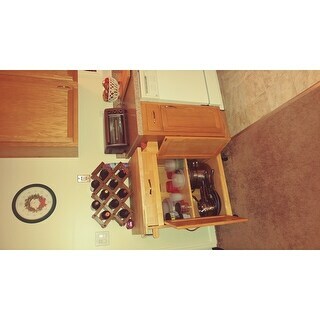 It looks very nice in my kitchen and adds tge needed storage I desired. Just having issues with the wheels staying locked and in place. The item is a very nice addition to our kitchen. It is something that we can use for any future moves. it is great for extra storage and easy to move and secure with the locking wheels. The quality of the wood is good and most of the unit is solid wood not pressed partical board. Also the top butcher block is great quality solid hard wood. The unit is a little time consuming to put together but the instructions were very easy to follow. It took just over a hour to assemble using a cordless drill . Overall a great investment if you need extra counter space to prepare food and additional storage for kitchen items. I love this cart. Cleared some clutter in my small kitchen and gave me a worktop. I would have given it a 5 but my daughter-in-law put it together and had to use some wood glue on a part that came broken but I can't tell where it was broken...she said it was small. Very worth the price. So far it is working out perfect and it’s sturdy too! Not real easy to put together but not real hard either since my daughter put it together herself!! I bought this for my daughter and she absolutely loves it!! 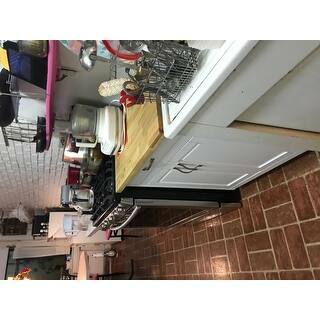 This kitchen "island" is perfect for our small space and limited storage in our kitchen. Assembly was quite easy, and all of the components work smoothly. The drawer was large enough to fit an expandable flatware holder, and we especially liked that the color off the wood and design matched our existing kitchen. The only downside was a broken/ slit rail on the drawer. We opted to patch it ourselves rather than wait for a replacement. 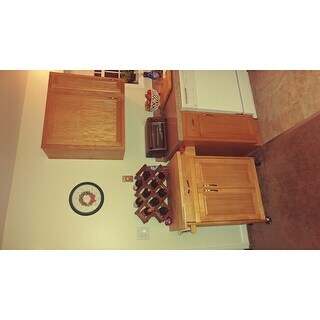 I received my kitchen island just yesterday, I totally fell in love with it. All the pieces were there and in good condition. The instructions for building the island was very understandable, although it took me about an hour and a half to build...it was so worth it!! !...Thank you Overstock..P.S. I would definitely recommend this product to all of my friends and family in need of a kitchen island. The size is perfect for my kitchen. I can chop up vegetables and turn around put them in the pan for cooking. No walking all over the kitchen. You can move it it you need to easily. I bought the kitchen cart in white. I put it in my kitchen between the stove and the sink. I didn't attach the side racks. It moves around on its casters very easily to be able to clean behind it. The cart is more beautiful than it appears in the picture. The only problem is that one door does not stay open when I open the doors. Other than that, I am very pleased with it!! Nice cart -- mostly real wood and not too hard to put together. I like how all the parts are labeled and it comes with all the "tools" you need, but of course real tools are better. One screw on a handle was stripped, but we found a replacement. The wheels are a bit industrial -- we may replace them with furniture legs. The back is a bit papery and loose, so treat it gently. Overall looks nice and will add a lot of kitchen storage. You don't have to install the racks on the sides if you don't want to. This is my second kitckend island I’ve purchased .very easy to follow directions . All parts are marked very well easy put together . Good and sturdy all the way around . While it was not the easiest piece of furniture I've ever assembled, it wasn't bad. Took me about 2 1/2 hours to complete. I really like the look. There are two things that I didn't like however, hence the 4 stars. First, there was a warning sticker on the top surface that was hard to remove, and left a very sticky residue. Second, the spice rack and the towel bar need to be interchangeable. It would be better for my kitchen layout if I could have them reversed from the mandatory configuration. "Is the shelf in cabinet adjustable?" "What are the dimensions of the butcher block?" "What are the dimensions of the counter top?" "Why is leaving off the spice and towel racks not recommended?" "what are the dimensions of the unit without the towel bar and spice rack? " The dimensions are 32 inches W x 19 inches D x 35.5 inches H.
"can you leave off the spice rack and towel bar? if so, what are the dimensions of the cart?" No we do not recommend. The right size and I'm hoping quality material. The measurements and the color are exactly what I was looking for. I choose this island because of the style, size and amazing price.